Breaking News: The Diary of Anne Frank was Also Written by Her Father! Most of us are familiar with the Diary of Anne Frank in which a 13 year old girl writes in her own words about Nazi occupation and coming of age under the unimaginable circumstances of hiding under Nazi occupation. Anne Frank perished 70 years ago in the Bergen-Belsen concentration camp but her words survived thanks to her father, Otto Frank, the only surviving family member, who published Anne's diary in 1952, explaining in the book's prologue that the diary contained the words of his daughter. Now, the New York Times reports that Anne Frank's diary has a new and previously undisclosed co-author, Otto Frank. How can that be? The Swiss foundation that owns the copyright to The Diary of Anne Frank is on record of stating that Anne's father is not only the editor but also the co-author of the diary, warning that others who were waiting for the copyright to expire will be sorely disappointed. Why would the foundation do that? Copyrights in Europe expire 70 years after the death of the author, which means that the diary's copyright, if she were the only author, is on the cusp of its expiration date. (Not so in the United States when it would expire in 2047, 95 years after the first publication of the book.) Expiration of the copyright would have important financial implications for the Anne Frank Foundation, which distributes proceeds from the book to various charities. Should the diary become public domain, the Foundation would lose all control over and royalties would cease. According to the New York Times, announcement of the new co-author "provoked a furor" among stakeholders of Anne Frank's legacy, in particular the Anne Frank House Museum in Amsterdam, and other people who want to publish the diary without royalty restrictions. 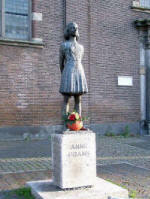 Some threatened to publish the work even if the Anne Frank foundation carried through with its intentions. One interesting aspect of the furor is that announcement of a new co-author might jeopardize the book's copyright on grounds that the Anne Frank foundation lied for years about Anne Frank being the sole author of her diary. In another interesting twist, the New York Times believes that if the copyright remains with the Anne Frank Foundation, its copyright might extend even beyond 2050, 70 years after Otto Frank's death. That is because a second editor, Mirjam Pressler, revised, edited and added 25 percent more material from Anne Frank's diary for what was called a "definitive edition" in 1991. She qualified for a copyright for her creative work, and the rights were transferred to the foundation, said its lawyer, Kamiel Koelman. The quest to extend copyright protection is not new. See our previous article about how corporations have managed to do this in the United States through the legislative process. When is a patent owner entitled to 'enhanced damages' for infringement? Section 284 of the patent statute provides that the trial judge may award the patent owner money damages for infringement and may increase those damages by up to three times the patent owner's actual money damages. The statute appears to give the trial judge broad discretion to enhance a money damage award for patent infringement. If section 284 were widely and uniformly applied, 'enhanced damages' would provide substantially increased money awards to patent owners and act as a substantial deterrent to patent infringement. The Federal Circuit Court of Appeals, which hears appeals of patent cases, has severely limited the discretion of judges to award enhanced damages. The Federal Circuit created a two-part test: enhanced damages are only available if (1) the infringer acted despite "an objectively high likelihood that its actions constituted infringement of a valid patent", and (2) "that this objectively-defined risk was either known or so obvious that it should have been known to the accused infringer." The Federal Circuit also concluded that whether the infringer's conduct meets this 'objective recklessness' standard is a question for the judge, not the jury. As a result, an award of enhanced damages is difficult to obtain and, if obtained, is easy to reverse on appeal. The problem with the Federal Circuit's approach is that it is not supported by the statute and appears contrary to the recent Supreme Court decision of Octane Fitness v ICON in a closely related area; namely, whether a trial judge in a patent case may award attorney's fees to the prevailing party. As has happened several times in recent years, the U.S. Supreme Court has stepped into the fray and has accepted appeals from two Federal Circuit cases on the question of enhanced damages. The two cases are Halo Electronics, Inc. v. Pulse Electronics, Inc. (14-1513) and Stryker Corporation v. Zimmer, Inc. (14-1520). As a general rule, when the Supreme Court accepts an appeal from a Federal Circuit patent case, it will reverse the Federal Circuit and write new law. We suspect that the Supreme Court will restore discretion to assess enhanced damages to the trial judges, which is a good thing. We'll be watching these consolidated cases closely.